Grandkids Could Be One Reason Humans Live Long Lives : Shots - Health News Grandparents often help out with homework, baby-sitting and cooking. Historically, that elderly help and care might have given the grandkids an evolutionary payoff — the longer-lived, the better. 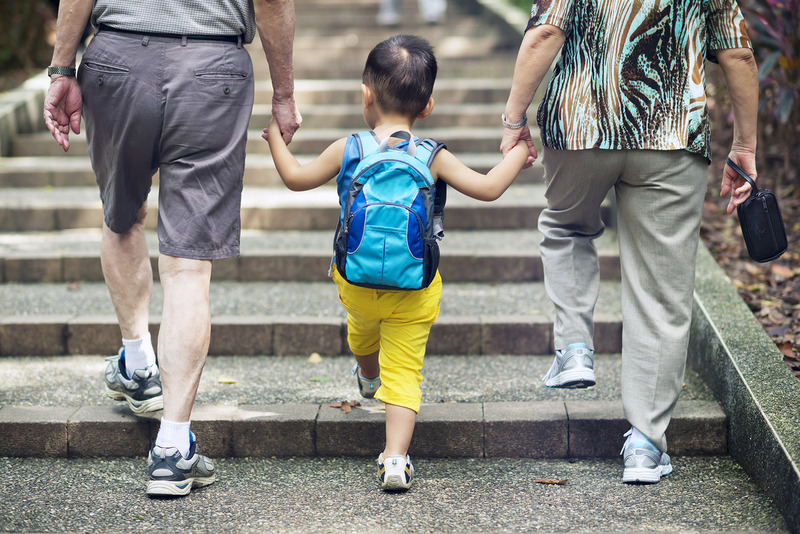 Helpful grandparents can give a kid a leg up. For humans, life isn't nearly as short as it is for other primates, whose minds and bodies start to deteriorate around the time they reach the end of their reproductive years. Once an animal has created offspring, it has done the heavy lifting of evolution. We, on the other hand, can continue on well past the time when the kids have flown the coop and sometimes celebrate birthdays measured in triple digits. So why do our bodies bother holding themselves together when we're no longer passing on our genes? It very well could be that sound, active grandparents earn their evolutionary keep by helping their descendants survive, researchers say. The older folks who stick around provide knowledge, food and nurturing that give their grandkids a boost in life. A study published in the Proceedings of the National Academy of Sciences on Monday found that gene variants that protect against Alzheimer's disease as well as a host of other variants that lower risk for late-life illnesses like Type 2 diabetes and heart disease are common in humans. But they're not found at all in other great apes. Other primates have the same genes, just not the protective variants. That difference could be because evolution has been selecting for these protective genes in humans by keeping grandparents alive and strong long enough to help their grandchildren, according to Dr. Ajit Varki, a medical researcher at the University of California, San Diego and senior author on the study just published in PNAS. "Now you're really seeing natural selection for good grandmothers," he says. The idea that grandparents are able to provide an advantage to their offspring got some scientific traction after a 1998 study done on hunter-gatherers. Children with foraging grandparents were better-fed, and their mothers had to shoulder less of the child-rearing burden. "Then those mothers could move on and have more babies," says Kristen Hawkes, an evolutionary anthropologist at the University of Utah who worked on that study. But if a grandparent has dementia or is in poor health, those benefits vanish. Rather than being an extra resource, the elder becomes a liability. "You've gone from a helpful grandmother to an extra baby, which is the opposite of what you want," says Varki. Having genes that protect against a deteriorating mind and body in old age means you could spend more time helping out your grandchildren. But just because those genes weren't found at all in other great apes doesn't necessarily mean their presence in humans is the result of natural selection. Mutations can appear and even become common just by random chance. Or the genes might have arisen for other reasons, since they could be useful for things other than protection against late-life mental and physical diseases. "It is impossible to say which of those might have caused apparent signatures of natural selection," wrote Andrew Clark, a population geneticist at Cornell University who wasn't involved with the study, in an email to Shots. The study also focused on a gene that confers a slightly lower risk for Alzheimer's late in life, but Dr. Deborah Blacker, a genetic epidemiologist at Massachusetts General Hospital and Harvard University who did not work on the study, agrees with Clark. It's unlikely that could have had a strong effect on natural selection, she says. "Of course, they're right that elders probably contribute more in a highly social species like humans than elsewhere, but, in fact, most people didn't historically live to the age of risk for Alzheimer's." Late-onset Alzheimer's doesn't affect people until around the age of 70 or 80. Throughout much of human history, most people probably would have died before reaching that age. After all, life expectancy for Americans didn't hit 70 until the mid-20th century for women and the late 1970s for men. Many people quite possibly would have had great grandchildren by that age, too. The loss of a grandparent wouldn't be as costly at that point. Despite the caveats, help from grandparents still could have had some effect on our genetics, just perhaps not a strong one. "I don't think there would be strong selection" for these protective genes, Blacker says. "But it's possible. I mean, I think grandparents are great."